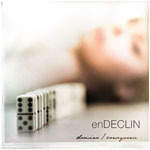 After 4 years En Declin comes back with an album that travels into the magniloquent vision of their music world….The sound gets inspiration from the modern melancholic rock of Anathema and something of Katatonia and that is, in my opinion, the perfect reference point of the band….The style mixes Alternative Rock and Post Rock. An almost fair production that is in my opinion better from those listened to from the bands belonging to those ones who doesn’t have a contract with a major. The album?...the construction of the songs, concerning the sound ….the atmosphere is good; there are all elements for a good cd, but sometimes the band tries to find very complicated melodic structures that (in my opinion) are not brilliant…the songs don’t leave a remarkable input in your mind….and, at the end of the album, the final result is not up to the task. There’s a very important engagement concerning the arrangement…that is very good…but I don’t appreciate the lack of the mood that this kind of music needs that regards most of the songs contained in this album. I like “Consequence” that gets a good melancholic mood…and the song is a good mix between melancholic rock and alternative…another good track is “Keyword out of context” that gets a very great mood into a song that seems to get a very involving spring atmosphere and remind me of Klimt1918. The final impression is of an album that “could be” a great magniloquent one…but it is not…. Neither the Beatles cover “While my guitar gentle weeps” is sufficient to overturn my general opinion, even if it represents another fair song for this album. The album is closed by the Italian version of “Keyword out of context” that in Italian language seems good! What can I say more?...The band has found a good sound supported by a more than enough production …but I hope to listen to better songs for the future.